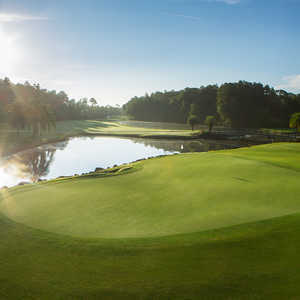 Styled in a classic country club setting, Disney's Lake Buena Vista Golf Course meanders through pastel villas, pine forests, palmettos, sparkling lakes and other wonders of nature. Lush fairways and well-protected greens make this course as challenging as it is beautiful. Add an island green on the 7th, and it all tots up to a great golfing experience. Of all the Disney courses, the Magnolia supports a greater abundance of wildlife. At any given time, you're likely to see deer, osprey, alligators and turtles. A flock of wild turkeys has brought several tournaments to a standstill while they pecked along its fairways. The course features elevated tees and greens with wide and generous fairways graced by over 1,500 magnolia trees that bloom from late spring to mid-summer. 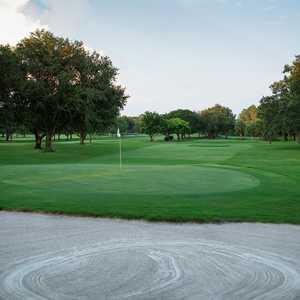 The 9-hole Oak Trail Course at Walt Disney World Golf Resort in Lake Buena Vista, FL is a resort golf course that opened in 1982. 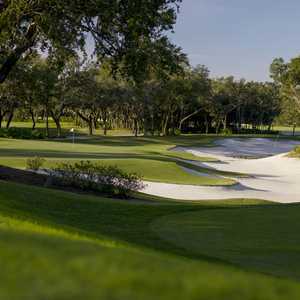 Designed by Ron Garl, Oak Trail Course at Walt Disney World Golf Resort measures 2913 yards from the longest tees and has a slope rating of 123 and a 34. The natural Florida woodlands provide a stunning backdrop to one of America's premier resort courses. Architect, Joe Lee, designed the 6,870-yard Palm with elevated tees and greens. The key ingredient, of course, was the Florida palm and he made good use of nearly every variety for aesthetic and strategic purposes. Tranquilo Golf Club at Four Seasons Resort Orlando (formerly known as Osprey Ridge) winds its way through pine, oak, and cypress tree hammock. Florida swamp and numerous backcountry duck ponds serve as stage settings and as framing for many of the holes. Fazio designed this course to be in unity with the environment, but this trek through nature is no walk in the park.